University of Central Florida President John C. Hitt wanted an experienced leader with a passion for academics and athletics to serve as his interim director of athletics. Enter the most successful football coach in UCF history. George O’Leary, in his 12th season as a Knight, will serve as interim director of athletics through the end of 2015. At that time, a decision will be made about how to move forward for 2016 and beyond, Hitt said. Calling the interim appointment “another great adventure” in his life, O’Leary stressed the five qualities he will bring to the job: leadership, organization, accountability, responsibility and trust. The Knights have won seven American Athletic Conference championships in 2014-15, including the second consecutive conference football title under O’Leary. In addition, UCF boasts the highest Graduation Success Rate for student-athletes of any public NCAA Division I FBS school in the nation. UCF’s 95 percent Graduation Success Rate ranks in the top five overall among FBS schools, alongside private institutions Notre Dame, Stanford, Duke and Northwestern. O’Leary will begin as interim director of athletics on July 11. 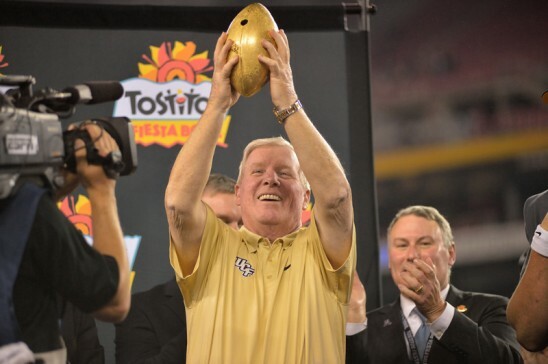 It's a great day for George O'Leary and UCF! His integrity and tenacity should serve us well now and hopefully, for many years to come. Go Knights! !